Virago Spirits is all about character. Inspired by the Virago, a heroic woman of great strength, courage, determination, and vision, we work to infuse those very characteristics - the spirit of Virago - into everything we do and all that we make. Whether to pursue the impossible or celebrate life's victories, Virago Spirits promotes strength of character and honors those who personify the Spirit of Virago. As people, we promote character. As a company, we produce Character, Distilled. International travel offers Barton the opportunity to bring back memories of adventure, curiosity, and comfort. It doesn’t matter where you are - people around the world offer a drink to break the ice or as a sign of friendship. With a beverage in hand, he believes the style, method, and flavor contained within a well-made cocktail embody the spirit and nuance of local culture. It’s personal, and that’s a beautiful thing. 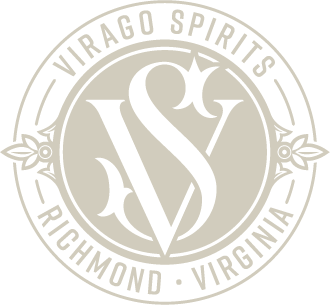 With this, Barton will focus on introducing Virago Spirits to the world, one distributor at time. Spirits are a sign of hospitality and Brad has seen this firsthand across the globe. Traveling from Richmond to Beijing for his law practice, he’s experienced the fellowship that comes with sharing food, drink, and conversation with a new friend. It’s a moment to slow down in a busy world and appreciate the company around you. Today, Brad blends his legal career with a passion for distilling to guide Virago Spirits on its path forward. Richmond’s adoration for food and beverage drives Vicki to bring that same passion and hospitality to Virago Spirits. Following college and graduate school, Vicki has worked for both a non-profit and a Fortune 500. Through her career in human resources and as an active mom of three teenagers, she knows how to get things done. Vicki rallies the team and manages Virago’s tasting room, events, and community outreach. Food and spirits foster memories and have the power to bring people together in the enjoyment of life. Barry hopes to create that same experience for those who imbibe in Virago Spirits. After a career in investment banking in both Chicago and Frankfurt, Germany, he began conducting research in Berlin as he worked towards a PhD in history. He currently balances playing dad to twin girls and managing distilling operations at Virago. Relationships, honesty, and trust drive long-term sales. Luke has built these relations through over a decade of experience in the restaurant industry -- both behind the bar and in beverage distribution throughout Maryland and Virginia. Luke now proudly calls Richmond home and enjoys being part of the city’s burgeoning food and beverage scene while spreading knowledge of “forgotten spirits” once enjoyed globally.